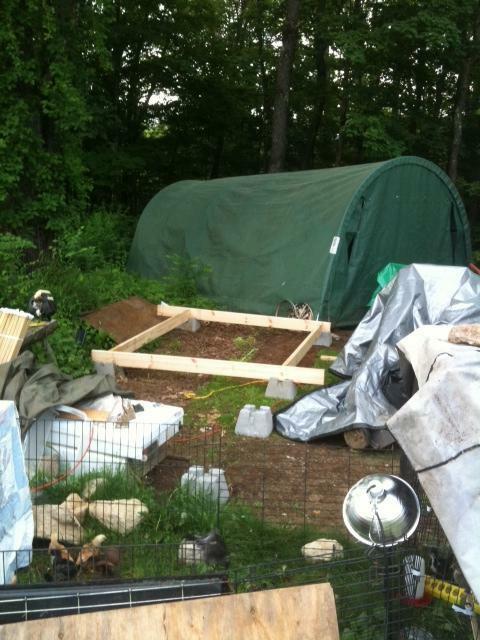 Greetings from southern New Hampshire where I have become the general contractor to a group of 11 pullets. It is nice to know that my 41 years of engineering and 32 years of soldiering aren't wasted! Below is a picture of my customers, taken a couple of weeks ago. They have filled out significantly since then, I can tell you. We have five Black Jersey Giants, four New Hampshire Reds, one Welsummer and one Welsummer that turned out to be a Cochin! That is the population, thus far, but my bride is going to talk to the store about a replacement for one chick who didn't make it, and I suspect there will be more. This is my first foray into the wonderful world of poultry husbandry. My bride has experience as a kid. She suckered me into buying five Indian Running Ducks as ducklings. 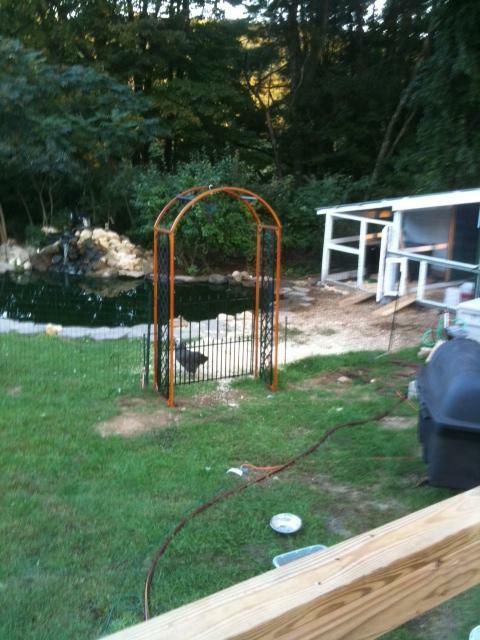 It was obvious that her diabolical plan was to get the pond she wanted in the backyard! 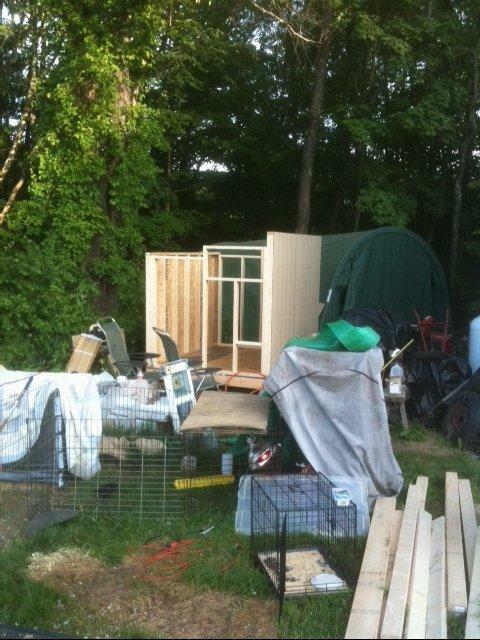 Anyway, here is the proposed site for the chicken condo, right behind my wood shop. 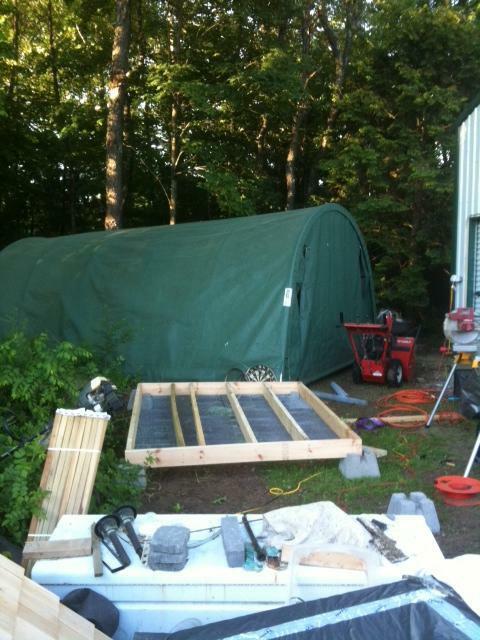 The Quonset in the background will be moved to a permanent platform on the other side of the shop. 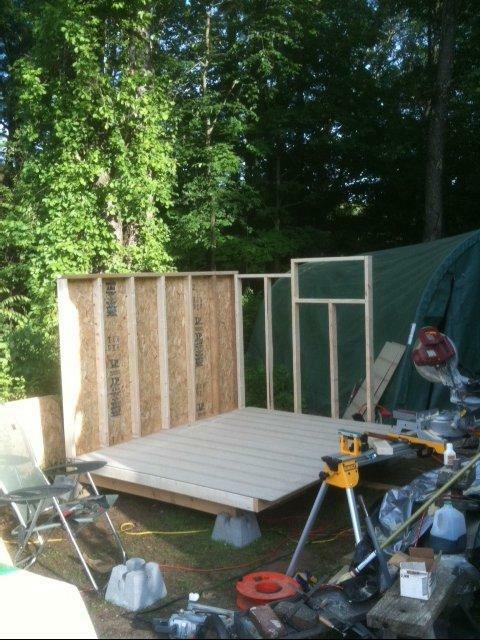 Last weekend, I got an early start on Saturday and layed the floor and started on the walls. The next pictures show the work that was done on one day. The east and west walls, being rectangular, were framed and paneled before raising. The north and south walls were just framed. Once they were ready, they went up fast! Getting the west wall up took determination a touch of madness, 'cause I did it alone! The north and south walls have framed openings for standard basement windows. They will be moved inside out in order to allow opening and closing the windows from the outside. The north wall has a people door and a chicken door. 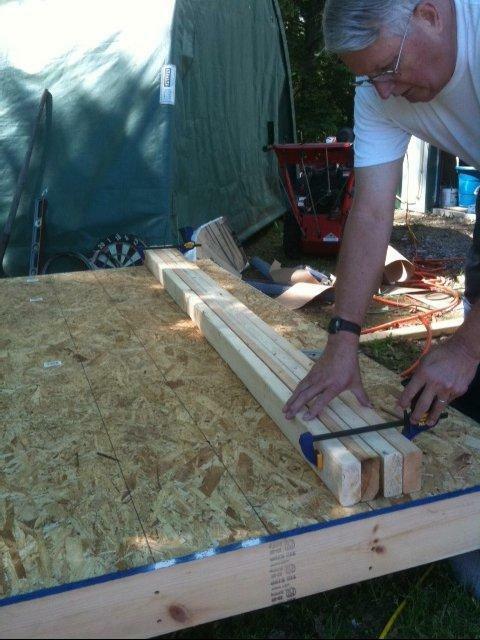 On Sunday, after church, the north and south walls were paneled and the opening cut in them, the rafters were marked and cut and put up on the coop. 1 by 4 slats were nailed to the rafters to serve and support for the metal roofing panels. 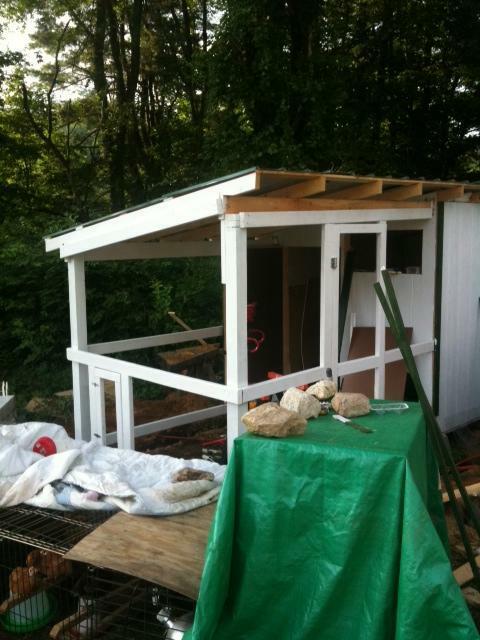 The following pictures show the progress. 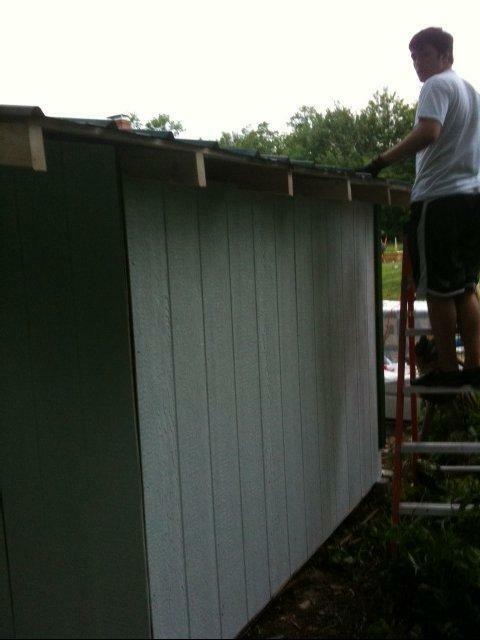 My son Jack was a great roofer. 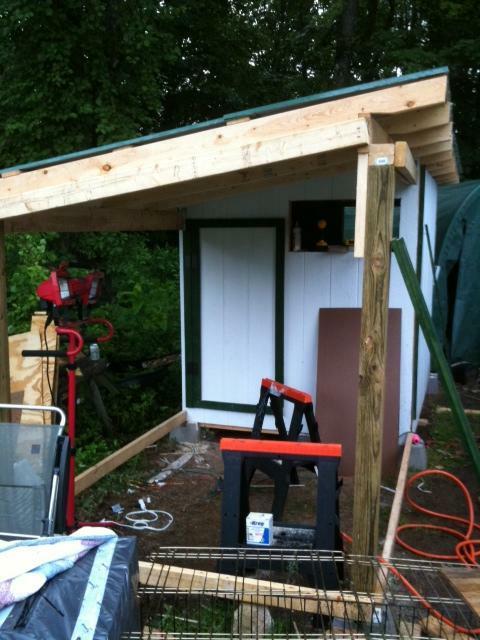 Jack finished the roof on the coop while Barb takes care of the customers. After a productive two days, it was time for the building inspectors to gather on the pond and discuss their findings. Spats, our surprise Cochin pullet is framed in the arbor. The waterfall is in the background. Prior to the fencing, we had 24" tall, roll-up picket fencing and x-pen to enclose the yard. 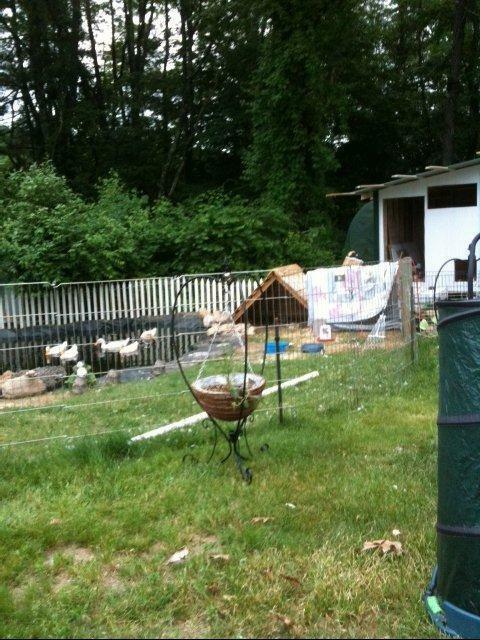 The pickets were anchored at the waterfall, which the ducks and chickens used to get out. Once we install the fencing and removed the pickets, it took the chickens a full day to find the waterfall without the pickets to guide them! 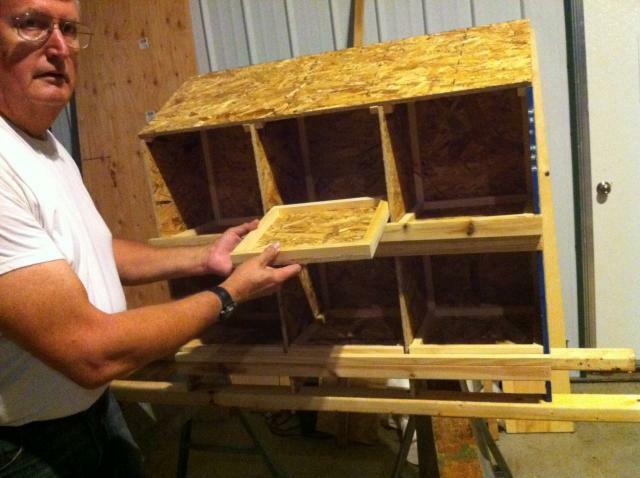 Last evening, I built a nest box assembly for the chickens. The ducks have been laying their eggs wherever the mood struck them. Here is a picture of the "six-holer" with one of the bottoms removed. The removeable bottoms will aid in cleaning the nests. 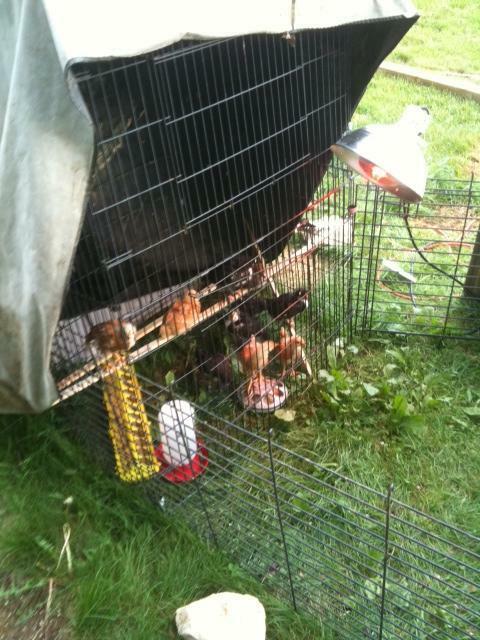 Also, a few weeks ago, we received five Maran pullet chicks. They are growing like weeds in their brooder in the dining room. This week, they will be transferred to a larger pen, still in the dining room and hardened-off for inclusion into the flock. We will then have five Black Jersey Giants (One Roo), four New Hampshire Reds, one Cochin, one Wellsumer and five Marans. Also, we have five Indian Runner Ducks (Two Drakes and Three Hens - all laying). It is so relaxing in the evening to sit out on our new deck and watch the antics of the above birds. Looks good so far. The coop seems a bit small for that many chickens but I'm not sure if the biog side is for the chickens and the little side for the ducks or the other way around. Be nice to see the inside when it is finished. Love the removable bottoms on the most boxes! Awesome idea!